"I was going to do it, but..."
Staying committed to exercise is tough. No doubt about it. Sheer willpower just doesn't cut it. Check out this video and learn 3 powerful motivators that have helped me stay committed to exercise. Did you catch my blunder? Hint it's near the end. Spend. Invest in yourself. Invest in your health. Spending money on a gym membership or personal trainer changes how committed we are. We become more emotionally invested because of our feelings toward spending money. We work hard for our money. We won't waste it. When's the last time you just threw money out the window? Share. With everyone. The more people- the better. They can hold you accountable. They can encourage and recognize your efforts. They can join you. You don't, and shouldn't, go it alone. Share your exercise endeavors and health goals with those around you. Schedule. Carve out time to commit to exercise. Life is sometimes a calamity. Emergencies pop up. Work runs late. The weather won't behave. If we are intentional about creating time and a place for us to focus on our health we will succeed. 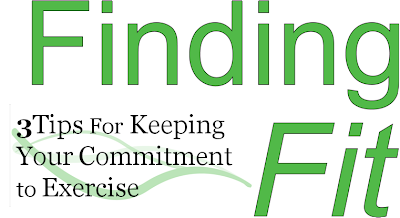 Which tip (spend, share, or schedule) holds the key to committing to exercise in your life?